The Husband and I headed over the bridge to St Pete for lunch. I really, really love St Pete. There are so many cute little stores (stationary and jewelry everywhere! ), awesome museums (The Dali, Chihuly), and great restaurants and bars. I wish we spent more time over there, but I hate the drive (hint hint Tampa Bay- build a rail system!). This time I let the Husband choose a place off of his Tampa Bay restaurant list. He’s been wanting to try the Tap Room at the Hollander for a while, so that’s where we headed. It was easy to find and there was plenty of parking available. After walking across an adorable front porch we headed in to the lobby of the hotel. The lobby is newly renovated and so freaking cute. It feels so comfy and friendly. Surely good friendships are started here. Adorable boutique hotel lobby. I really want to stay here. The Tap Room is adjacent to the lobby. 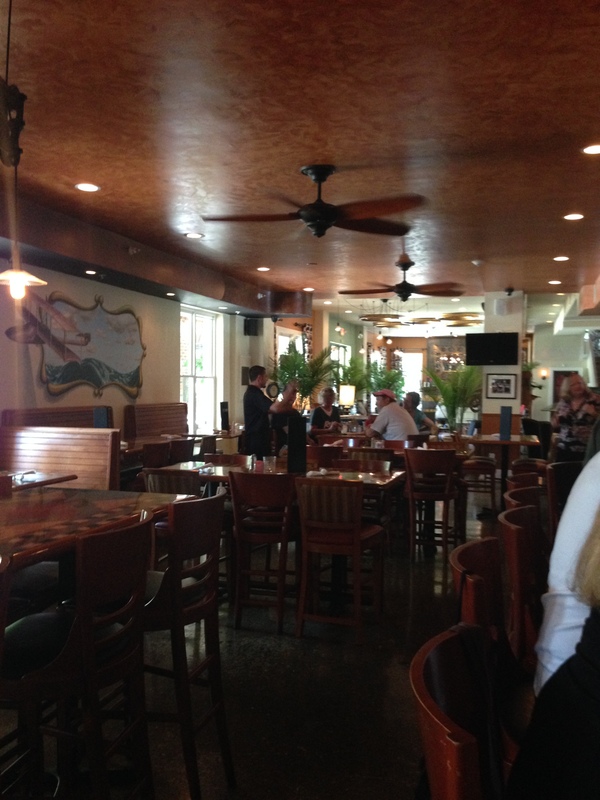 A nice bar area and a bunch of seats, as well as the outdoor tables, offer lots of places to sit. 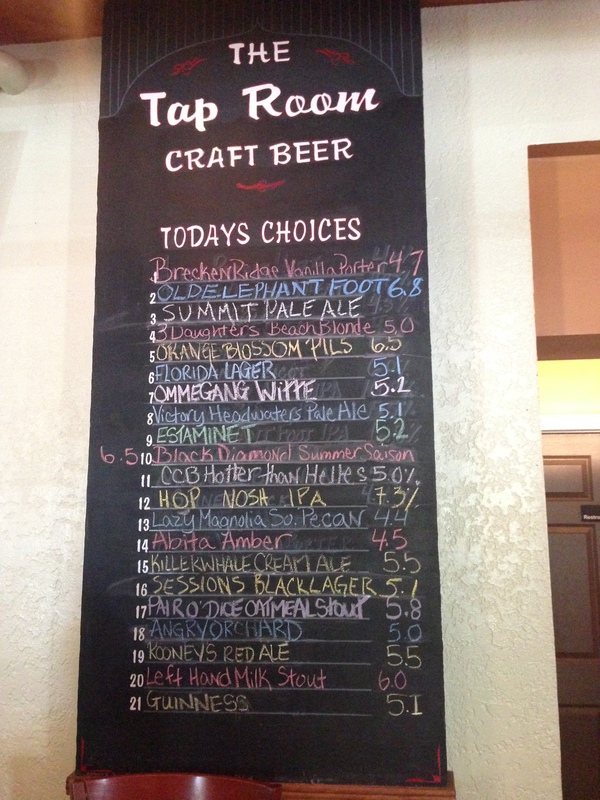 There are TVs (a necessity in case you happen to go during March Madness…) and a great draft beer list. Looking towards the lobby from the bar. The awesome draft beer list. So many choices! 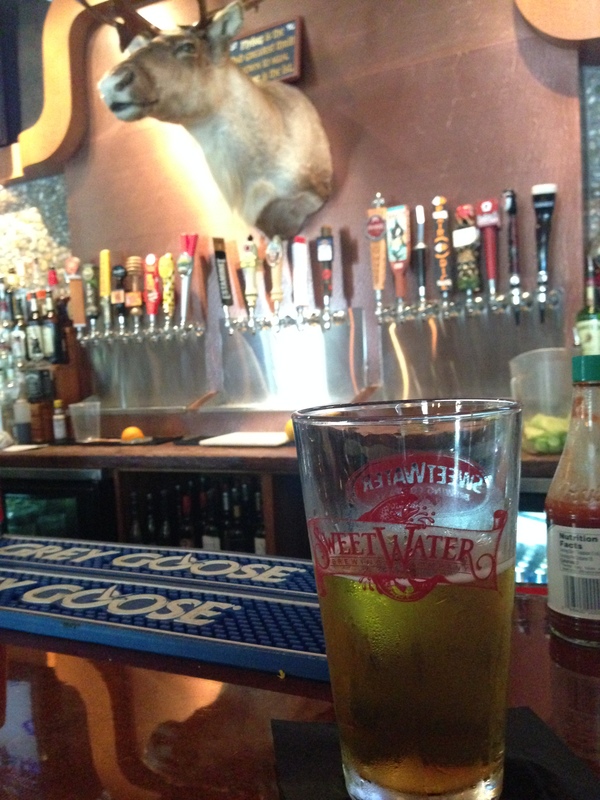 I decided on the Killer Whale Cream Ale. Growing up, everyone talked about drinking Genesee Cream Ale. It’s really pretty good, but I hear if you drink too many, it will…ummm..cause some GI upset. I decided everything is okay in moderation, and went for the cream ale. I’m glad I did because it was really good. My fresh, crisp cream ale and the awesome bar. Although I usually don’t care for animal heads, I kind of liked the placement of this one. It really fit the whole theme of the place. 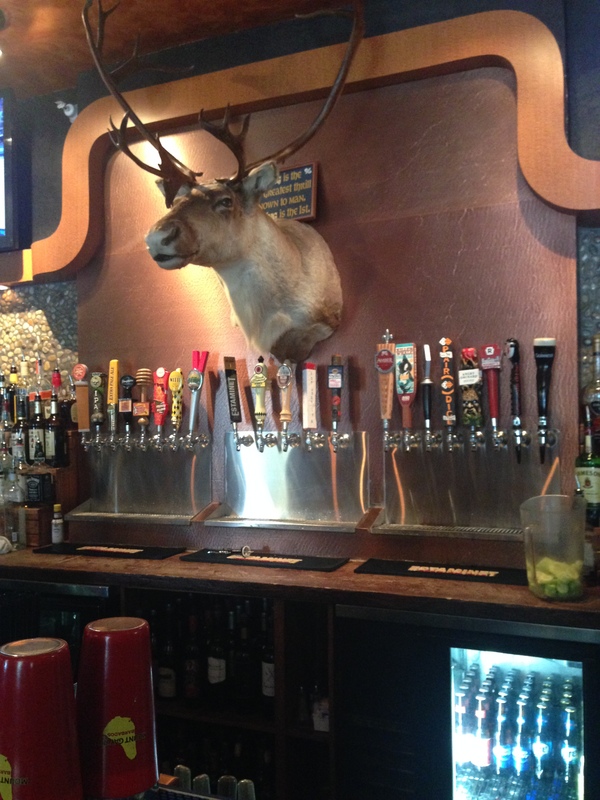 So many beers, with a reindeer watching over them. After the hard choice of beers was made, we had to decide on what to eat. The menu was really awesome. 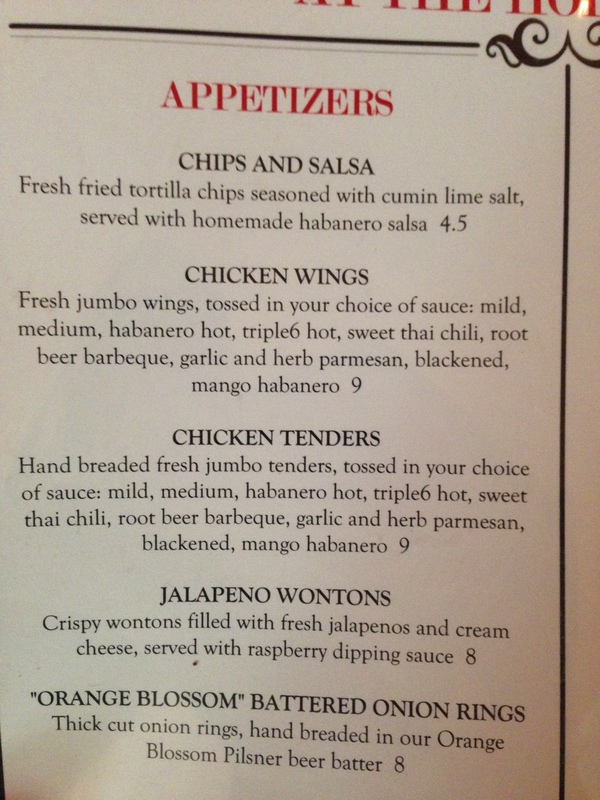 The Husband was excited about all the different wing sauce choices, especially the root beer barbeque. Check out all those sauces! Unfortunately, they were out of the root beer barbeque, so he settle on chicken tenders with medium sauce. The sauce was really good. As Buffalonians, I feel like we know hot sauce. 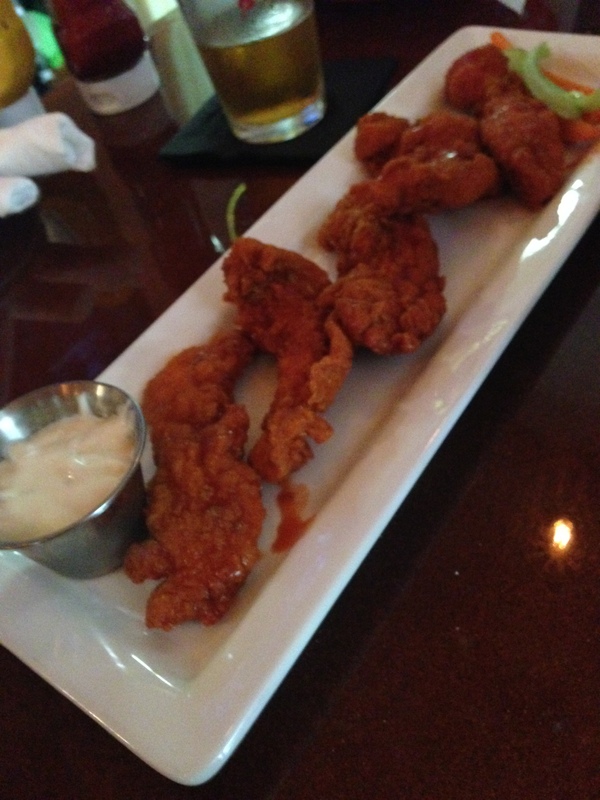 The tenders were a bit overcooked, but that’s better than raw. I went for the Coney dogs. Now, I don’t usually eat meat, mostly because I just don’t like it. But there is something about a hot dog with meat sauce that makes me happy in my heart. Brings me back to my childhood, going to Louie’s Hot Dogs. And I’m so glad I got them; they were fantastic! 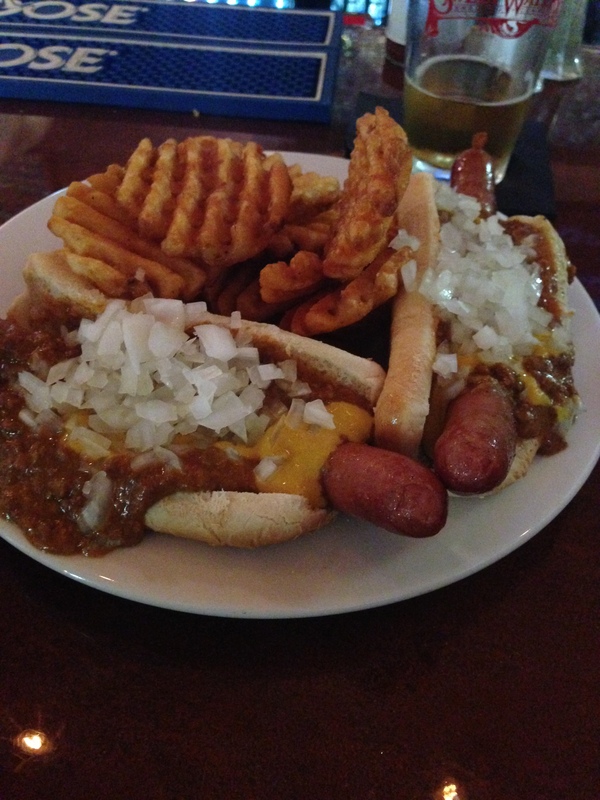 Classic Coney dog. Beef hotdog, meat sauce, mustard, and onions. The waffle fries were just an awesome added bonus. I really enjoyed our experience at the Tap Room. I hope someday I have an excuse to stay at the hotel.